> PPC > Google kills Right Hand Side Ads: what does this mean for marketers and users? As we reported over the weekend, Google has removed all PPC ads from the right-hand side of the search engine results page with immediate global effect. There’s been a great deal of speculation on what this means for businesses, advertisers and users alike, with many postulating that the top-of-the-page paid search is going to become even more cutthroat (and expensive), organic listings will be pushed even further off the first SERP (Google will start to show four ads at the top instead of three for “highly commercial” search terms) and that Product Listing Ads will gradually take over the SERP (PLAs are still allowed on the right-hand side). The change has already happened. There are now four paid search results at the top, with nothing on the right. It looks oddly blank now, and worryingly the entire above the fold space is entirely filled with ads. However there is one slightly positive change. There are more organic results below the fold. In fact there are nine blue links and two news stories, which is an improvement. But this is still probably a case of ‘too little too low-down’. Google’s decision appears to be entirely commercially driven, it would be naive to think otherwise, but has Google gone too far in sacrificing its own user experience for the searcher? Or will we eventually get to the point where the entire first SERP is filled with ads and we instinctively click straight to the second page, in the same way we skip past YouTube pre-rolls? We asked some experts from the search community what they thought of the matter. 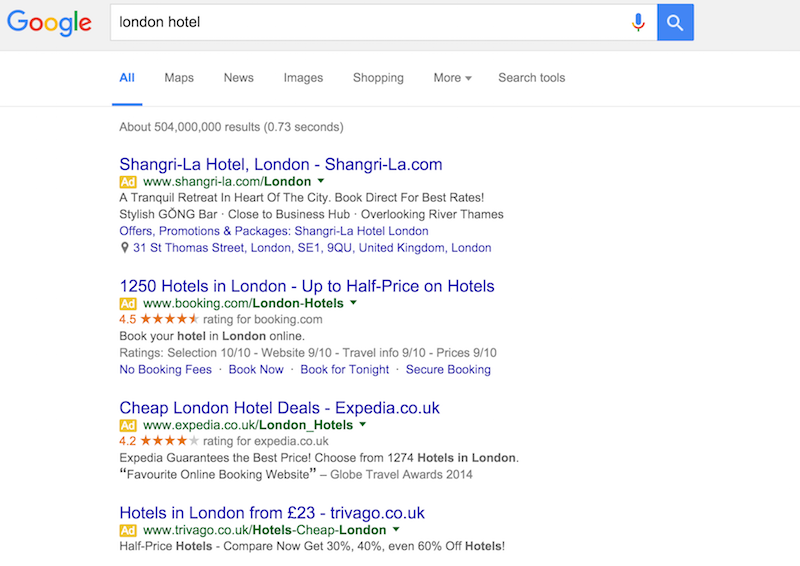 Why has Google decided to drop ads on the right hand side of search results? Is this a way to extract more revenue from top ads? [Julia Logan] I would suppose so, given the eye tracking studies, and with reports of typical non-technical users hardly distinguishing between ads and organic results, this step tends to blur the line for such users even more – after all, sidebar ads stood out clearly as ads. However, I was trying to look into the history of sidebar ads and found this article proving this is not their first attempt to ditch sidebar ads, although the previous one did not involve increasing the number of ads above the organic results. [Kevin Gibbons] The obvious answer is revenue and I’m sure that is a big factor of course. But I think it’s likely to be a balance between this, and a more modern, perhaps centered, search experience which reflects mobile vs. desktop and tablet results. Ultimately changes like this have to be beneficial to the search experience, otherwise Google ends up chasing short-term revenue instead of long-term market share. [Sam Silverwood-Cope] My Dad asked me the other day, “How come Google is free?” Well Dad, this is how it makes money. If some people don’t realise the top advert spots are actually advertising (like my dad), I think most are aware that the right-hand side are paid positions. Most people do not click on PPC ads for general searches. So not content with the existing two or three adverts, plus the Google shopping results, plus any other self-promoting comparison widget they put up, Google in its wisdom, has decided to expand the real estate of PPC in the main bulk of the SERPs at the cost of an organic spot. What does this do for organic search? What should site owners and SEOs do in response? [Julia Logan] We could of course panic and bemoan the death of above-the-fold organic SERPs but this may not necessarily be the case. With the rise of adblockers, whatever anybody is doing with their ads can potentially become irrelevant. Assuming the worst case scenario, site owners and SEOs should do what they have always been doing – compete against paid ads. If you rank for a commercially meaningful keyword, make sure you do everything in your power to make your organic listing stand out – metatag optimisation (yes I do realise this is 2016 now), Schema and other options suitable for your particular site. Ads will evolve, becoming more interactive and visually attractive – this means you should not be left behind. [Kevin Gibbons] My advice is to aim high. We’ve definitely see a significant shift in first page clickthrough rates over the last couple of years especially in organic search. Ranking on page one is often not good enough anymore, every term is different – but I’d recommend that you really should be aiming top three now, otherwise there’s likely to a big drop-off in clickthrough rates. Also, become the brand that people think of before they even get to typing a query into Google. Whether it’s paid listings, competitors, vertical search or anything else that may get in the way of potential customers visiting your site, try to make sure they get to you first and then remember who you are, so that they come straight back the next time. [Sam Silverwood-Cope] Despite my moaning, and hankering for the good old times, I think it makes things quite interesting for SEO. The additional PPC spot is supposed to be for premium terms (for now). These terms are highly expensive per click, so it’s up to the vendor to decide whether the top spot is worth it, or whether it would be an interesting bidding war to lose and then to vie for the organic spot above the fold. A good strategy would be to push organic and take a lower PPC position. With the right tracking tool, alerts can be used on organic positions to react accordingly for the bidding. This blended search approach will be won by the most competent, well equipped digital teams. Does this improve or harm the user experience? [Julia Logan] If the user’s goal is to find whatever they are looking for, the answer will largely depend on whether the AdWords algorithm is better than the organic algorithm, and also whether businesses spend money on ads thoughtlessly and run ads with poor targeting. [Kevin Gibbons] The jury’s out on this one; the negative could be that searchers want to see the natural listings rather than too many ads at the top, and the positive could be a cleaner layout and improved experience. I have to try and look at this from a non-SEO perspective, and as much as I’d like to see the organic results as high as possible, if I’m honest I think the new layout might improve the experience. I would add that this isn’t an overnight change and I don’t expect this to be the last experiment we see either. [Sam Silverwood-Cope] Like a young rock band committed to making quality music and “never selling out” then chasing the mainstream buck with the third album, Google doesn’t seem to prioritise its legacy of organic quality any more. “In Google we Trust” meant we used this superb search engine above the basic or advertised-burden competition. Too many adverts, and especially poor adverts, will eventually turn the user off. But this will only happen when there is a competent viable competitor. I had a good chuckle reading some of the doomsday predictions this morning. We did some actual analysis here and what I can tell you is that Side Ad and Bottom ads account for 14.6% of total click volume (this is looking across thousands of accounts). Keep in mind that ‘Bottom of Page Ads’ aren’t going away. So, for starters, we’re talking less than 14.6% of clicks impacted by the change. Now, those “lost” impressions and clicks can more than be made up by A) the addition of the new fourth ad spot B) 78% of SERPS have fewer than 4 ads above the organic results – there’s plenty of room for that to go down and C) the addition of up to four ads below the organic search results. It’s like we just re-organized the naming of ad positions. As a result, I see no impact on AdWords auction dynamics (clicks, impressions, CPCs, etc.). The only ‘loser’ is organic search which is completely gone from above the fold space on desktop for any commercial query. There are also incremental benefits to paid search from the change, for example, now all ads can use call-out extensions, sitelink extensions, location extensions, etc., which were previously only a benefit of top-of-page ads. And the ads appear ‘more native’ which may have additional benefits. In quantifying the impact of this, I should also add that the change is for desktop only, which accounts for less than half of searches. So we’re talking 14.6%/2 = 7.3% of queries impacted. Basically, keep calm. This is a net positive for paid desktop search.